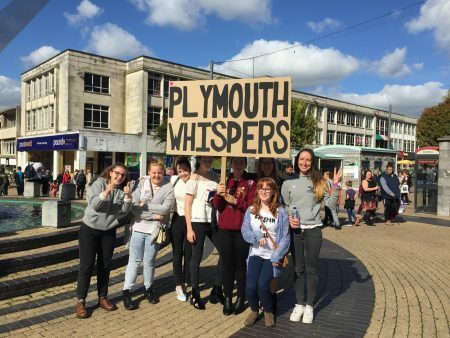 ‘Plymouth Whispers’ is a participatory project organised by Laura for Plymouth Art Weekender 2018. ‘Plymouth Whispers’ is a playful socially engaged work based on the game of broken telephone. The work was run by Laura and three fine art students from Plymouth University, Lucy Rostron, Molly McAndrews and Sarah Daniels. We moved across the city, whispering a story from person to person. Plymouth Art Weekender is an ambitious three day event that takes place annually across the city. The fourth Weekender will be held on 28th – 30th September 2018. The Weekender confidently celebrates Plymouth, its people and the visual arts, promoting the city as an exciting contemporary art destination. The Weekender showcases a wide and diverse range of activity for all ages including a large array of events and exhibitions throughout the city by local, national, and international artists.